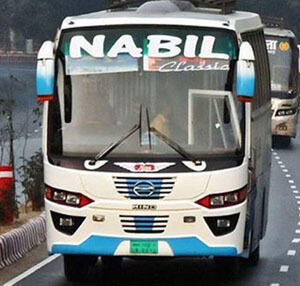 Nabil Paribahan is a recognized bus service in northern Bangladesh. They provide the services with Scania K410 imported from Malaysia. It is a sister concern of Shohagh Paribahan Private Limited. Nabil Paribahan gives the passenger service by only Non-AC bus service. Unlike Shohagh Paribahan, they have no AC bus service of Scania or Volvo. They have covered all the possible route of north Bangladesh. Nabil Paribahan Offers you 1 ticket with buying two tickets for the occasion of Ramadan. The additional ticket is available for all the routes of Nabil Paribahan. The offer will be effective from June 3, 2017, to June 9, 2017. After the day, the offer will be invalid and next offer will be announced. You can buy your necessary ticket from any counters of Nabil Paribahan. You can also book your seat over a phone call. The manager of the counter will provide your booked seat after your payment. You can also buy a ticket from the online. Buying a ticket from online is very easy. It saves your valuable time and money. You can buy Nabil Paribahan online bus ticket from shohoz.com. The international service is not available yet. If it is available, a notice will go to the press and social media. Ø Passengers should reach at the bus stand at least before 20 minutes. Ø Every passenger can carry the luggage of maximum 10-kilogram weight with him/her. An additional charge will have to give in the case of more than 10 kg weight of luggage. Ø Passengers cannot carry illegal goods with him/her. In the case of carrying illegal goods, the authority is not responsible for that. Ø Smoking is not allowed on the bus. Ø Passengers should take a token after giving their luggage in bus bunker and keep that token safe for receiving their luggage back. Handbags and other goods in the bus, passengers have to keep under their own responsibility. Ø If passengers come late at the bus stand and miss the bus, transport fare will not be given back to them. Though the buses of Nabil Paribahan is good, the employees and staffs are not well trained. I think management will take strict initiatives for the purposes and provides better service.